Nosebleed is medically known as Epistaxis. Nosebleeds can appear to be terrifying and scary, but nothing to worry about, as they rarely indicate any serious health problems/issues and can be safely treated at home. 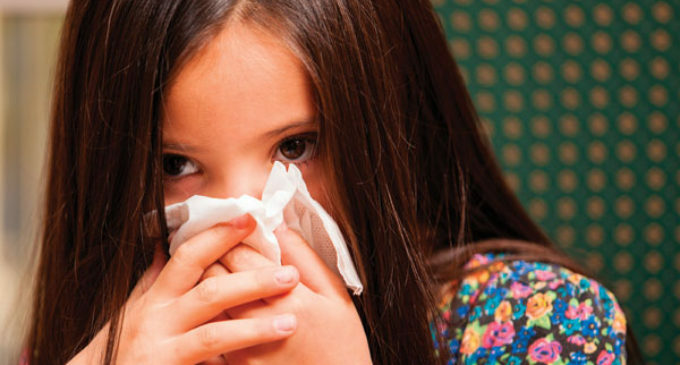 Nosebleeds can happen to anyone: children, pregnant women or elderly people. During nosebleed, blood flows from either one or both nostrils but it does not last any longer than a few minutes. Our nose consists small and delicate blood vessels which may bleed on any damage. Generally, nosebleeds are not serious, but frequent and heavy nose bleeds may indicate some serious health issues like high blood pressure or a blood clotting disorder or anaemia. Read below to know some common causes, symptoms and treatment for nosebleeds. Anterior nosebleed: It is a condition in which the blood flows down from the front part of the nose. It is very common and can happen to anyone and may not lead to any serious health issues. Such nosebleeds can be cured at home safely. Posterior nosebleed: It is a condition in which the blood flows down from the back part of your nose and may further flow down to your throat. This is a rare condition and may indicate a serious health problem. This needs to be treated immediately by a doctor and should not be treated at home. Most of the times, nosebleed do not require any medical attention, as it can be recovered at home. But if in any case nose bleed does not stop within 20-25 minutes, then immediate medical care is needed. This can be a case/sign of posterior nosebleed, which is a serious health problem. 1. Normal breathing through your mouth while leaning forward can help in draining the blood. 2. Place a cold wet cloth or an ice bag on the bridge of your nose. 3. If nosebleed is caused by a foreign object, then going to a doctor would be helpful. This is also because you may end up hurting yourself more if you try to remove it without any supervision. Doctor will remove the foreign object with extreme care. 4. If you have anterior nosebleed then it can be treated securely at home. In order to stop nose bleed, sit with your face up and squeeze the soft part of your nose gently and keep squeezing it till 7-10 minutes and breathe from your mouth with your nostrils fully closed. Make sure, you do not sit with your face down as it may result in you swallowing the blood. After 10 minutes, check if blood is still flowing. If yes, then repeat the same till the bleeding stops. If bleeding does not stop, then prefer seeing your doctor, as it can be the case of posterior nosebleed, which needs to be treated immediately. Posterior nosebleed is rare and often indicates serious health issue. In posterior nosebleed you bleed from back of your nose which directly flows down the throat. Consult to your doctor immediately if you think you have posterior nosebleed. 1. Try keeping a humidifier in your house to keep the dryness away. 2. Use sprays or gels to keep nasal membranes moist. 3. Avoid scratching or picking your nose. 4. Avoid doing activities which may injure your nose or prefer wearing a head gear. 5. Consume aspirin moderately, as more consumption can lead to thinning of your blood and contribute in nosebleed. 6. Limit your intake of nasal decongestants. It may end up drying your nose passage and cause nosebleed.